The GS820 expands upon the conventional source measure unit technology by featuring two channels of four quadrant operation. Each channel is isolated from one another and comes armed with a voltmeter, ammeter, voltage source and current source. The GS820 source measure unit features dual source/measure channels, enhanced signal resolution, and data storage to handle a multitude of applications from FET testing to effiency characterizaiton, all in a sngle, compact, unit. Four-quadrant operation consisting of source operation (current source) and sink operation (current sink) is available. The output and measurement resolutions are 5.5 digits. Two models are available for your application. 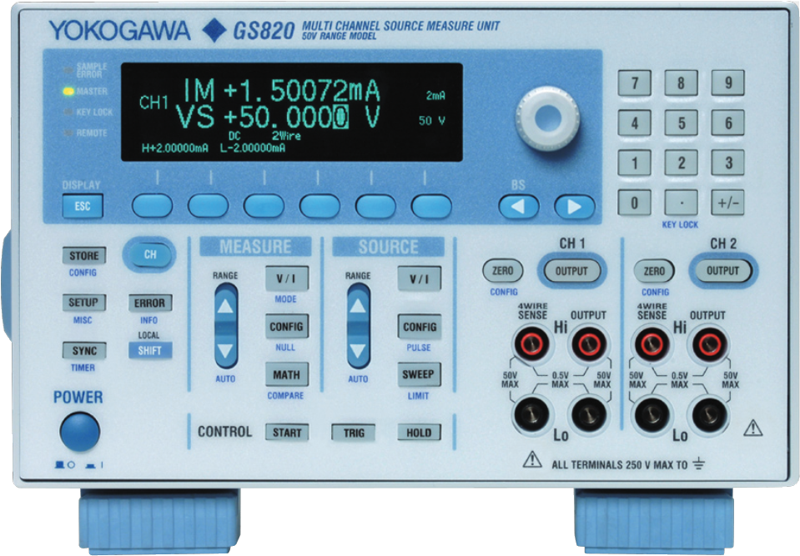 The GS820 is equipped with two analog channels with each channel consisting of a constant voltage source VS, a constant current source IS, a voltmeter VM, and an ammeter IM. 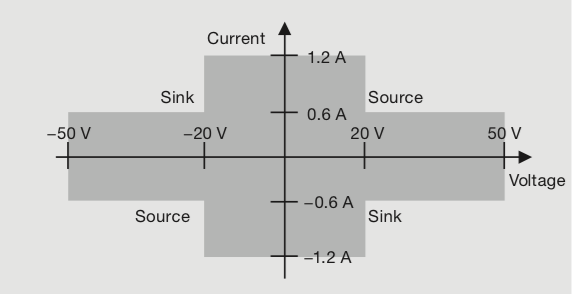 The two source measure channels are isolated. These functions can be selected for each channel to form an arbitrary combination of functions. Allows voltage sensing of a two-wire system or four-wire system by switching between local sense and remote sense. 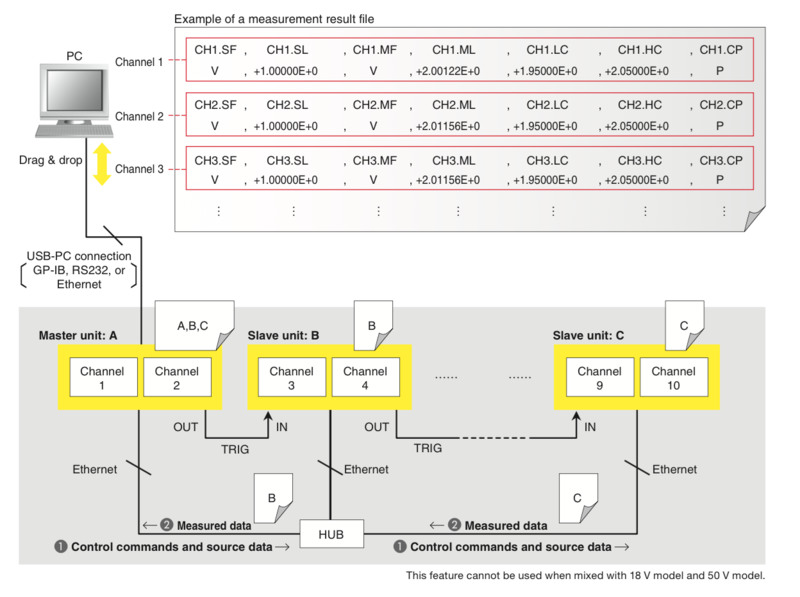 The combination of the source and measurement functions of two channels allows the testing of various DUTs. The GS820 performs generation and measurement using its internal timer or a trigger input such as an external input signal. When a trigger signal is received, the GS820 starts generating a signal after the source delay time elapses and carries out a measurement after the measure delay time elapses over a given integration time. 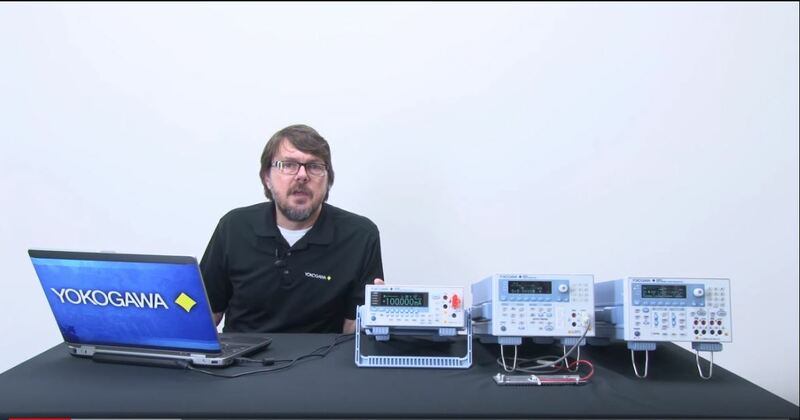 The measurement integration time can be set in the range of 0.001 PLC to 25 PLC. *² Additionally, the GS820 provides an auto zero measurement function, which measures the internal zero reference after the measurement and performs offset correction in real-time. The integration time of the auto zero measurement is equal to the measurement integration time setting. The GS820 allows the generation trigger source and measurement trigger source to be set separately. 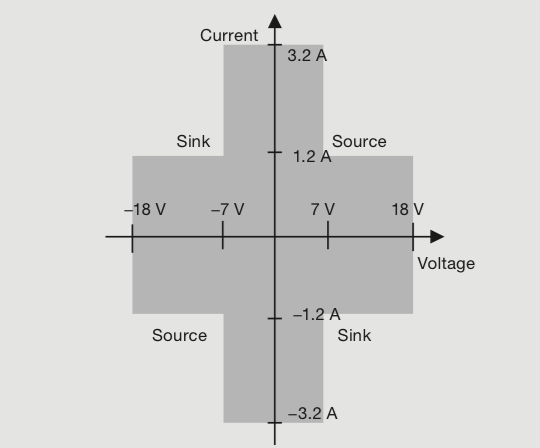 There are two types of constant period timers and an external signal input that can be used for the generation trigger source. In addition to these sources, source change point and sweep end point can be used for the measurement trigger source. Because the source trigger and measurement trigger can be set separately and also separately for each channel, source and measurement under various connection conditions and timing combinations can be accommodated. There is also an auxiliary trigger that can be activated using an external signal or a program event. 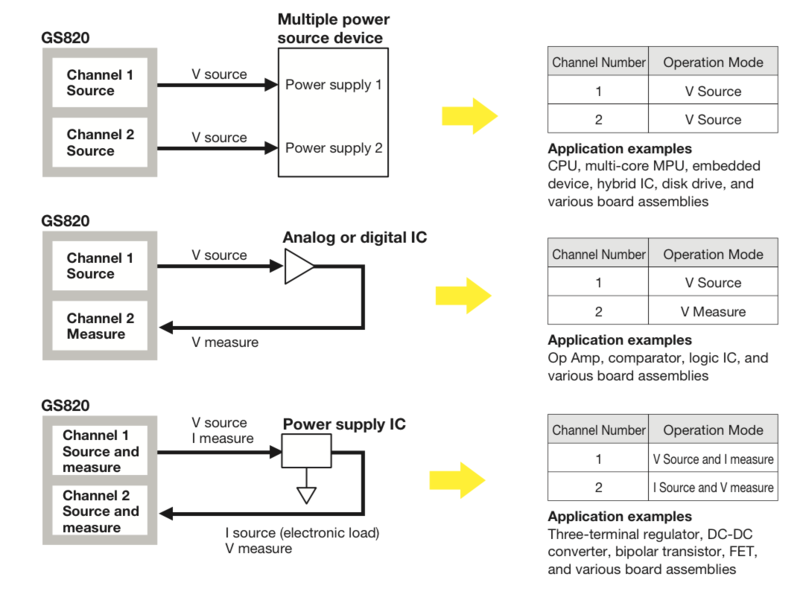 The source delay, measure delay, and integration time can be set separately for each channel. The various trigger sources available on the GS820 allow the source and measurement to be executed asynchronously. 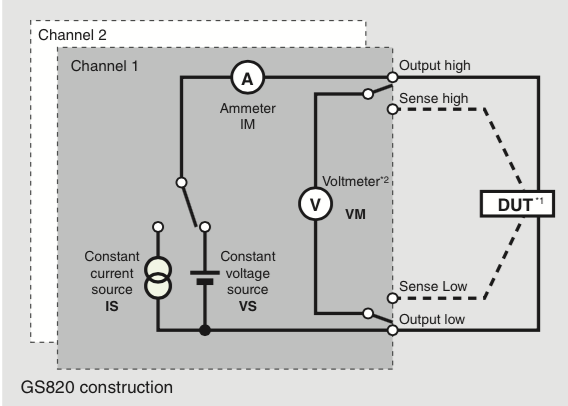 The figure below shows an example in which separate timers are used for the source and measurement to achieve multiple measurements in a source cycle. The voltage/current generation block of the GS820 operates in DC generation mode or pulse generation mode. Each generation mode has preset operation modes such as continuous output, linear sweep, and log sweep that allow the user to perform sweep operations by setting simple parameters. The output level can be changed at a minimum of 100-µs intervals*¹ in each sweep mode. In addition to the preset sweep functions described above, the GS820 is equipped with a programmable sweep function that allows the user to define the sweep pattern. A user can create or edit arbitrary waveform data (CSV format) of up to 100,000 points using a spreadsheet or text editor. The GS820 is also of capable of sweeping the timing and control parameters in addition to the source level. 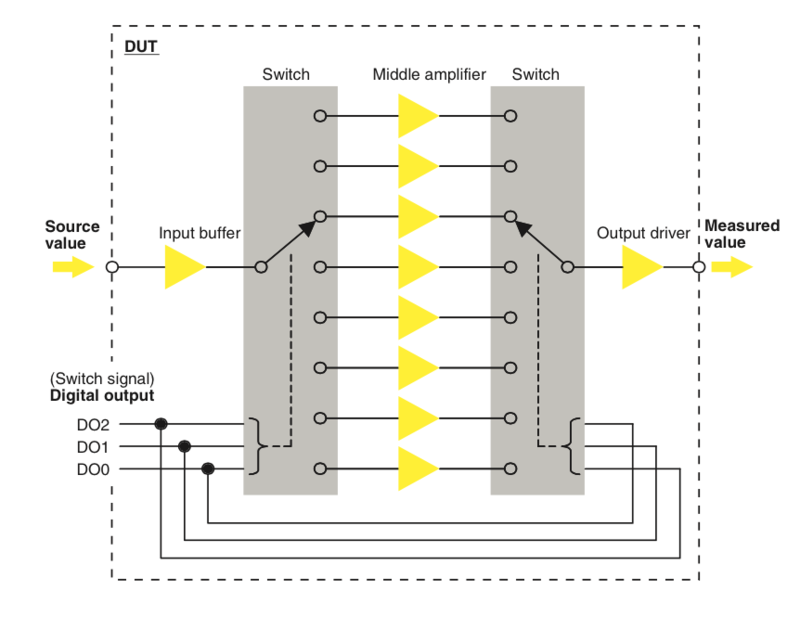 This allows a control sequence that is synchronized to the waveform generation timing. 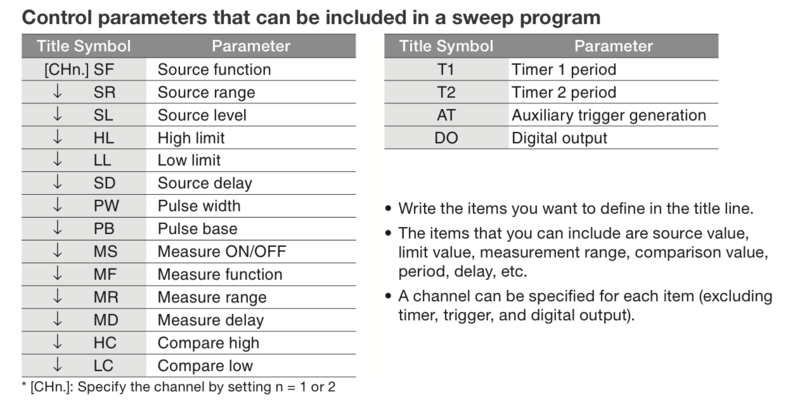 The sweep program can be changed at a minimum of 100-µs intervals*¹ in programmable sweep mode. The values do not include the hardware operation time corresponding to the control parameters. The GS820 allows the editing of test sequences suitable for auto testing on the production lines. A user can write program fi le parameters that are vital to auto testing such as the source value, measured value, high limit for comparison, low limit for comparison, comparison result, control bit output, etc. Because the program fi le is in CSV format, a popular spreadsheet application can be used to edit and view the program. The GS820 provides fast operation for production line tests. The measured results of test speeds (reference data) are indicated below. Expansion up to 10 Channels Using the Master-Slave OperationMultiple GS820s can be connected as shown below and used as a multi-channel source measure unit. The master-slave feature allows the program data of all connected channels to be set and collected by simply accessing the master unit. The master unit (1) distributes the source data to the slave units or (2) collects and merges the measured data of all slave units. Complete synchronization of all channels can be achieved by connecting the exclusive trigger signal line. The zero generation function of the GS820 generates zero voltage or current as well as controls the current/voltage limiter to limit the load current. The GS820 stops applying the voltage or supplying the current to the load in the zero generation state allowing the DUT to be disconnected with the output relay turned ON. This function avoids the problems of chattering and contact life of the output relay and reduces the time for turning ON/OFF the output. 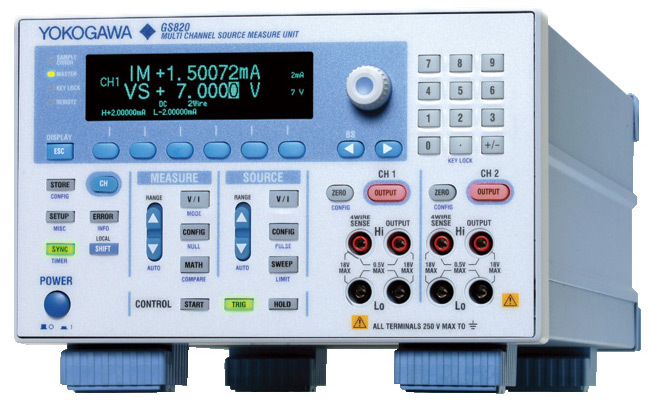 Source measure units combine the best features of power supplies and digital multimeters and have numerous applications ranging from battery simulators, semiconductor characterization, and efficiency testing on power electronics. The GS820 can measure drain current ID by applying gate-source voltage VGS from channel 1 and drain-source voltage VDS from channel 2. The GP-IB command of the GS200 shares the same mode as the 7651. It can be swithced to 488.2 mode. The following attached document details the typical output noise of the GS200 from DC to 20 MHz.